Rules: Two copies of one story (7000 words maximum). No names on manuscripts. Include cover sheet with name, address, phone, e-mail, title. Story must be unpublished and not under consideration for publication elsewhere. Simultaneous submission is not allowed. Stories will not be returned, so please don't send an SASE (self-addressed stamped envelope) for return. For acknowledgment of receipt, please include a self-addressed, stamped postcard. If you wish to receive the list of winners, please include a business-size SASE. Winners will also be announced on this website and in the writers' trade magazines. or phone (319) 273-6455 or send a fax to (319) 273-4326. The legendary Kurt Vonnegut has written dozens of books, including celebrated novels like Breakfast of Champions and Slaughterhouse Five. 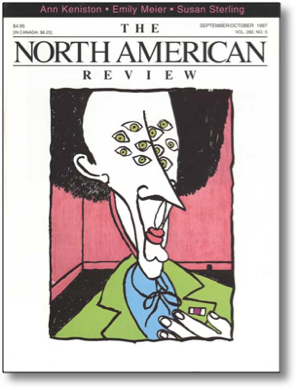 He has been a frequent contributor to the North American Review. Vonnegut’s latest book, God Bless You, Dr. Kevorkian, explores mortality and the afterlife with his trademark blend of science fiction, satire and social observation.